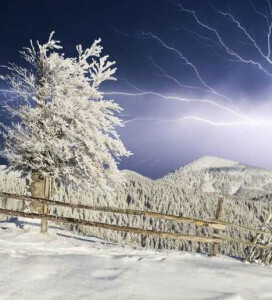 Thundersnow, also known as a winter thunderstorm or a thundersnowstorm, is an unusual kind of thunderstorm with snow falling as the primary precipitation instead of rain. It typically falls in regions of strong upward motion within the cold sector of an extratropical cyclone. Thermodynamically, it is not different from any other type of thunderstorm, but the top of the cumulonimbus cloud is usually quite low. In addition to snow, graupel or hail may fall. Graupel is distinct from hail, small hail and ice pellets.